Though Aspen, Rifle and other nearby airports are close enough most of the time, having the firefighting Chinook helicopter stationed at the Glenwood facility this past week when critically needed was one of the many factors that led to the quick and effective response to the Lake Christine Fire, which is now nearing 50 percent containment. 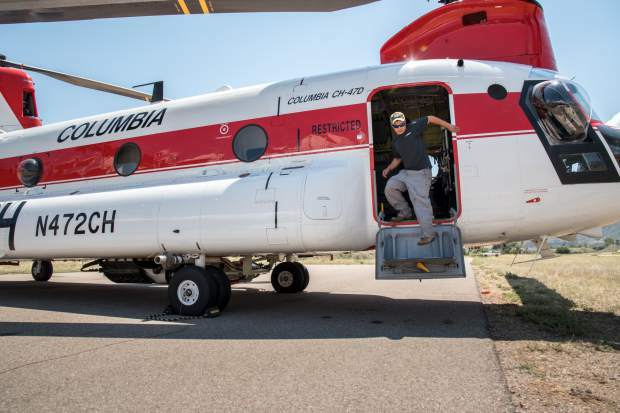 Rifle Garfield County Airport Helicopter Supervisor Chad Johnson, who helped with the firefighting efforts in Basalt, said the Chinook used in the Basalt fire has dropped around 270,000 gallons of water since it started working on the Lake Christine Fire. With fewer than 10 Chinook helicopters in the state, including one at the Rifle airport, Johnson said the helicopter is an effective tool for firefighters even when the fire is moving because dropping water on a concentrated, specific area can really help knock down flames. While single-engine air tankers are used for dropping retardant on the fire to control the spread, the Chinook is used to quell the flames directly.